Fylde maintained their unbeaten start to the season but had to survive a spirited second-half fightback by National League newcomers Havant and Waterlooville. 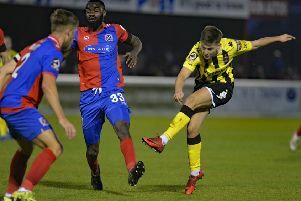 The Coasters were rewarded for keeping hold of hottest property Danny Rowe on deadline day as the striker fired his second goal of the season from the penalty spot to give his side a half-time lead. But the Hampshire hosts were perhaps unfortunate not to record their first win since promotion as they carved out several clear-cut opportunities after the break. Having named the same side for Fylde’s opening two matches, manager Dave Challinor made three changes, with full debuts for Arlen Birch, Danny Kane and Gime Toure. Joe Cardle and James Hardy dropped to the bench, while centre-half Jordan Tunnicliffe was injured early in Tuesday’s draw at Wrexham. A bright opening quarter brought some good passing football but no openings of note, and although the hosts gradually got on top the only shot of the opening 20 minutes was a 35-yard effort by Fylde’s Luke Burke which sailed over. The game finally took a dramatic turn on 24 minutes, when Rowe put Fylde in front from the penalty spot. The prolific striker had played the through-ball which released Toure, who got goalside of the defence and was brought down by Ed Harris. Rowe fired the spot-kick into the bottom corner. Rowe almost doubled the lead on the half-hour, when his volley from outside the box was turned around the post by veteran keeper Ryan Young. The Hawks counter-attacked immediately and went so close to scoring their first National League goal when Nicke Kabamba met Paul Robinson’s cross, though keeper Jay Lynch somehow turned his close-range effort against the bar. Alfie Pavey headed wide for the hosts but Rowe continued to threaten a second, testing Young with a free-kick, shooting over from a fine passing move and seeing a shot deflected wide from Birch’s fine cross. The visitors also had the final opportunity of the half when Neill Byrne headed wide from Danny Philliskirk’s cross. Havant were level within three minutes of restart as Fylde’s defence opened up for Kabamba to curl a shot into the top corner. They had the ball in the net again when Lynch’s poor clearance was intercepted by Kabamba on 51 minutes. Pavey fired home from close range but was ruled offside. And Fylde soon had another scare when Harris headed Bradley Tarbuck’s cross over the bar from no more than six yards. The visitors continued to live dangerously as Kane was fortunate not to mar his debut with an own goal, deflecting Kabamba’s low cross just wide, then Lynch needed to be at his best to keep Robinson’s close-range header out. Havant continued to dominate the second half and Lynch needed two attempts to keep out Wes Fogden’s effort just past the hour. The visitors tightened up at the back and finally had a second-half opportunity 11 minutes from time, though substitute Hardy’s shot was blocked. The hosts had the final chance in stoppage time, when Theo Lewis headed over from a corner. Fylde face more familiar opponents on Tuesday, when Solihull Moors visit Mill Farm. Fylde: Lynch, Burke, Francis-Angol, Birch (Cardle 70), Kane, Byrne, Bond, Croasdale, Toure (Hardy 55), Philliskirk (Hemmings 86), Rowe; subs not used: Griffiths, Tasdemir. Havant: Young Williams, Stock, Kabamba (Cosgrove 86), Fodgen, Harris, Pavey (Lewis 73), Tarbuck, Robinson (Carter 73), Rose, Robinson; not used: Woodward, Rutherford.